XOXO Jes - Canadian Entertainment News: What is Project Glass? Google revealed a new project they are working on. Project Glass is you wearing that head piece (above) doing what goes on in the video (below). Creepiest part: Paul is 402 feet away. Gross. This takes away my ability to lie to people about how close I am to meeting up with them. Also, for this to happen wouldn't Paul need this device as well? I see that Paul is sporting very legit glasses - crushing his ability to wear one of these head devices. Very clever Google. They are saying the device will be in testing by the summer and will probably be available some time next year for purchase (granted the world doesn't implode on itself in December). 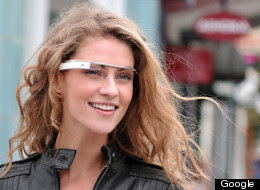 So what do you think...will Project Glass take off? Or will people shake their heads at it?